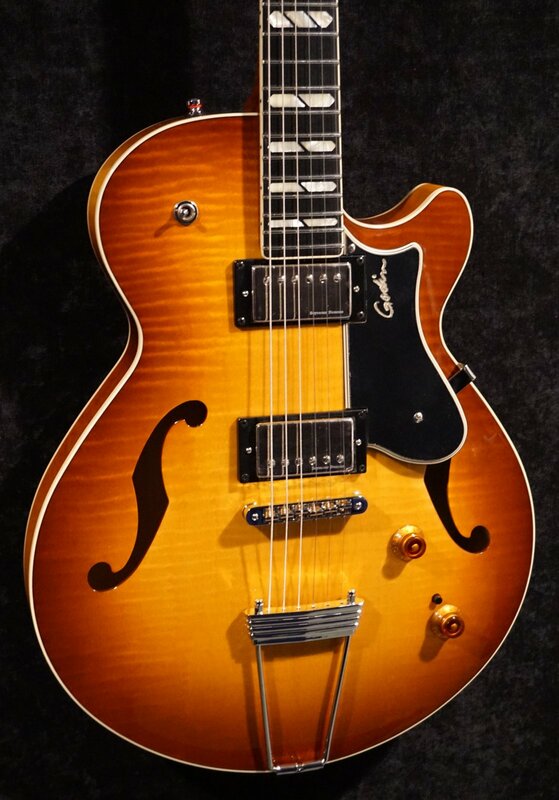 The Godin Montreal Premiere is a thinline, semi-hollow electric guitar, and it is destined to become an instant favorite within your guitar collection. This model is a vibrant & versatile electric guitar for rock, blues, and jazz players alike! It features an innovative and unique “breathe-through” carved spruce core, which gives the body of the Montreal Premiere an astounding resonance unlike any other guitar in its class. The Montreal Premiere Supreme features a beautifully figured flame maple top and back & sides, along with a bound headstock and fingerboard with large celluloid dot inlays. It is voiced with custom Seymour Duncan humbucker pickups and kept precisely in tune via the high-ratio Godin machine heads.